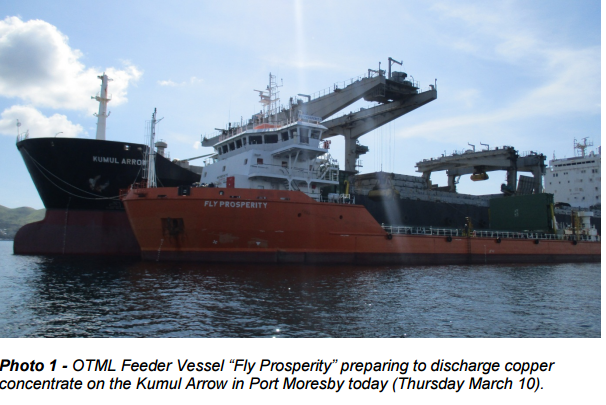 Ok Tedi Mining Limited (OTML) advised today (10th March) that following the restart of operations on 1st March the first cargo of ten thousand dry metric tonnes of copper concentrate has been produced and is being assembled on the silo vessel, the Kumul Arrow, anchored in Port Moresby. “OTML operations are off to a very encouraging start following the return of employees from a seven month suspension due to dry weather. The work completed on major projects during the temporary shutdown has positioned us very well “said OTML Managing Director and Chief Executive Officer Peter Graham. “Our workforce has returned enthusiastic to get restarted. The immediate priority is ensuring safe operation as we adjust to our work routine,” added Mr Graham. The Company also confirmed that following heavy rains during recent weeks the water level in the Fly River is now sufficient to sustain ship traffic. With the installation and commissioning of the new replacement SAG Mill shell expected to be complete in about a week, Ok Tedi will then return to full scale production.